This modem is a combination of ADSL2+ Modem, Router and a Wireless Access Point, capable of operating 150Mbps wireless transmission speed (Wireless-N). 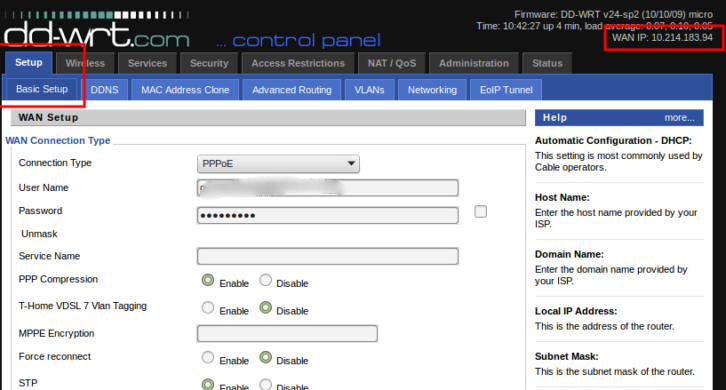 Router feature includes; Wifi with WPS feature, 1 10/100 LAN port, DDNS (dyndns.org only) and port-forwarding feature. Before you follow this guide, I like to inform you that the CPE (your Aztech router) used in this guide is custom flashed to work with Globe Broadband Tattoo’s internet service. In case you didn’t know, Globe Broadband is a local ISP here in my country (Philippines). Configuration with other ISPs using the same modem will still yield similar positive result, just make sure you enter the correct values in the important input fields (VPI, VCI values and etc). To start of with this guide, prepare the things enumerated below. Before starting with the initial step, login to your router’s administrative page and create a backup of your current configuration. If you’re not sure on how to do this, then the first step below shall be your starting point. You need to do this so in case you need to revert back to your original settings, you can use the backup file to restore your original settings. Note: The firmware/configuration backup page is locked with super admin authentication. You also need to have this information before proceeding. This is not supplied to you by your ISP, but you can Google your way around. admin and enter the super admin password. You can search for this info via Google or YouTube. When logged in, navigate to Advance Mode -> Admin page. Click Backup button and save/download your current config file to your desired destination. The default file name would be romfile.cfg, but you may rename it to whatever you want. This will serve as a backup in case you need to restore your configs. Ok cool, now you have a backup. You may now proceed to step 2. Let’s set the Aztech DSL5001EN ADSL2+ in bridge-mode. While still logged in, navigate to Advance Mode -> WAN -> ATM Settings page. You should see a page similar to the image below. Internet label won’t light up. It’s because there is no connection since the PPoE connection shall be done from the router that you intend to use with the Aztech modem. During this mode (Bridge Mode), you can only make a PPoE connection by using a separate router to make the connection with your modem, and eventually makes a connection with your ISP using your supplied user-name and password. You’re modem should in bridge-mode now, it’s time to configure your router to make the necessary PPoE connection. Note: DSL LED Light should be lit up. It’s an indicator that your Aztech DSL5001EN modem is physically connected to your ISP. Setup your DD-WRT router, or any router you might have. It could be a Linksys, D-link, Encore, TP-link router or some open-source BSD based Router OS like pfSense. Take note that, you need a router or any wireless router that has a PPoE connection support. In this step, I’ll use my DD-WRT flashed router (Linksys WRT54G2v1 wireless router), to make the PPoE connection. It is where I should put my ISP login credentials. Let’s continue. Our Aztech modem is now in bridge-mode, so it’s time for us to make the necessary PPoE connection, by using DD-WRT’s PPoE connection settings. So grab your extra LAN cable and hookup your router with the Aztech modem. Plug one end of your cable to your router’s WAN port (Yellow colored port) while the other end goes to Aztech’s WAN port (Yellow colored port). It doesn’t matter whether you use a patch or crossover cable. Modems and Routers these days have auto-sensing feature that automatically detects and adapts whatever type of cable you’re using. Make sure you’re computer is using the same network class as with your router. So if you’re router’s IP address is 192.168.1.1, your computer should use 192.168.1.2. Other settings are self-explanatory and easy to follow. After filling those important fields, you can finally click Apply Settings to make your changes takes effect. 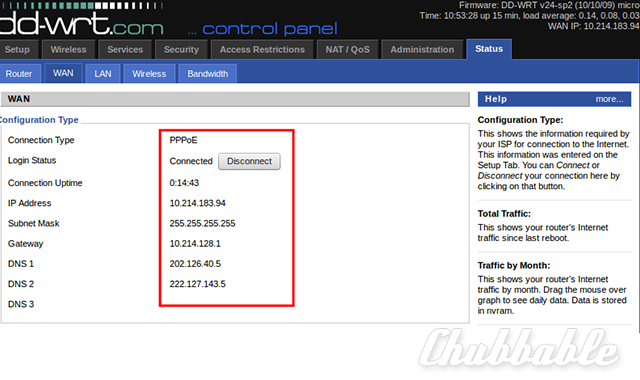 PPoE settings with other routers is very much similar with this one. So you can follow this guide with whatever router you might have. Upon clicking Apply Settings, your router should reboot and your browser will show a progress bar that indicates a reboot sequence. When your router reboots, it will prompt your to click Continue button, and just do as it says. Cross your fingers as your router reboots. Did it reboot? Ok cool. Login again and check if you got a successful connection. A good indicator for this is your WAN IP address. If you got this address, it means you’re already connected to the Internet. In my router’s screen-shot, you can see that I’ve got a dynamic IP address of 10.214.183.94. In addition to this, when you navigate to Status -> WAN page, you can see your Login Status as connected. It may be slightly different from your router brand/model, just look for similar pages from your router. When you got a WAN IP, you’re now set to browse the Internet. Congratulations, you made it this far. Are you successful in following this guide? If so, please leave your feedback below. If you’re not, I’ll try to help you in troubleshooting your issues and you can ask me a question by putting your comments. This is one real-world example of why you would set your ADSL Modem in bridge-mode. In my current setup, I have to put my Aztech DSL5001EN modem in bridge-mode because I need to interface it with my pfSense box. My pfSense box makes the PPoE connection plus, it sets a firewall and VPN connection between the Internet and my local network. In case you still didn’t know, pfSense has built-in support for OpenVPN (a free VPN implementation). I can’t live without an encrypted connection to the Internet. That’s why I chose to use pfSense (plus OpenVPN), to implement a basic home network security. This entry was posted in Howtos and tagged aztech dsl5001en, bridge mode, howto.